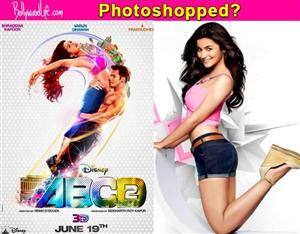 Photoshop disaster – Shraddha Kapoor looks like Alia Bhatt on ABCD 2 poster! Varun Dhawan and Shraddha Kapoor starrer ABCD 2 poster is out! But one look at it and you wonder if Alia Bhat has stepped into Shraddha’s shoes. The Haider actress in a pink and blue athletic apparel and black block heels perched up on a shirtless Varun Dhawan looked like Alia’s carbon copy! We do not know if this is just photoshop gone wrong or are the makers had specially instructed their team of designers to mould Shraddha in an Alia avatar! While the pose on the poster itself is quite uncomfortable, we must say the art work definitely screams that it is heavily orked upon. The designers seem to have put in so much efforts that they have literally erased every trace of the very gorgeous Sharddha from it. While we were shocked on seeing this first look, we wonder what were Shraddha’s thoughts about the poster. Awesome twosome: A happy Priyanka Chopra- Ranveer Singh launch the trailer of Dil Dhadakne Do- view pics! Ranbir Kapoor and Katrina Kaif married according to the Supreme Court!